If you haven’t caught David Smith’s monthly column for Money Metals Exchange, you’re missing out on some truly great – and free – commentary that every person who owns precious metals really must read. But today I’m giving you another chance. David Smith’s credentials as a writer and analyst are impeccable. 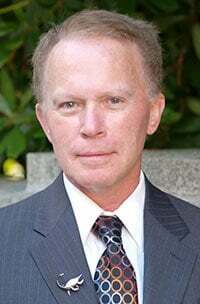 Prior to joining our Money Metals editorial team, he’d already spent 15 years investigating precious metals mines and exploration sites all over Argentina, Chile, Mexico, China, Canada, and the U.S. and frequently shares his findings and investment wisdom with readers, radio listeners, and audiences at North American investment conferences. I’ve been an admirer of David’s work for years and have benefited greatly from his knowledge and insights. The thing that has always struck me about David is his wise and calm approach to investing. He’s a philosopher and a teacher. Do You Trust Paper Promises or Physical Reality? You can also catch David Smith on the occasional Money Metals podcast, including last week’s! P.S. I hope you enjoy the informative news and commentary from experts like David Smith that we bring to you each week as a free service! I’m offering to pay you in actual cold, hard silver to try David Morgan’s newsletter for one reason and one reason only. Reading The Morgan Report each month will place you in the top one-percent of the best informed precious metals investors on the planet. Which is not only really great for you as a savvy investor, it’s good for me too – because if I’ve learned one thing in my years as founder and president of Money Metals Exchange, it’s that better informed customers are much better customers. 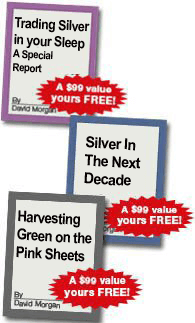 If you are really serious about making money in precious metals, you must get your hands on The Morgan Report, especially right now when Money Metals and David Morgan are teaming up to bring you an unbeatable offer. Simply sign up for a FREE trial of David Morgan’s membership-based investment newsletter devoted to uncovering the world’s most profitable opportunities in money, metals and mining, and Money Metals will “comp” you with one of our brilliant American Silver Eagles. In The Morgan Report, you'll discover strategies to help you safeguard your savings and grow your wealth even as the coming currency crisis draws closer. David also reveals his exclusive mining and natural resource stock recommendations for you in every issue! You'll know what to expect from the economy and the markets weeks and even months in advance thanks to David’s exclusive market commentary and forecasts. Plus, you'll get valuable advice for profiting from the changes ahead. You could lock in profits thanks to his carefully selected investment recommendations. David is famous for searching out value throughout the metals and mining sector, including some little-known and undervalued junior natural resource and mining stocks with a high risk/high reward profile. You'll get monthly updates on David’s recommended portfolio, plus his recommended asset allocations, to protect and grow your wealth no matter what the economy brings. 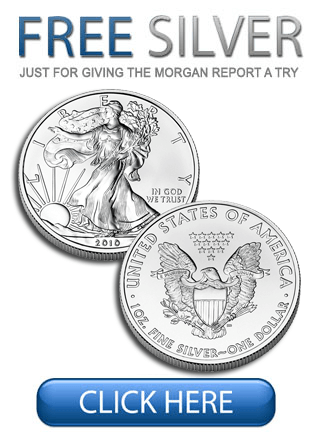 Best Deal: Give The Morgan Report a try today and get 3 FREE Special Reports – plus one ounce of .999 silver as a kicker! You see, I’m an avid reader of The Morgan Report myself. And once I began enjoying the profits and insights David’s newsletter brings, I knew I’d never even think about giving up my membership. In fact, The Morgan Report is must-reading for all the key personnel in Money Metals' offices. Better yet, when you become a Basic Plus Member now, you'll receive David’s monthly newsletter, marketing timing updates, and his investment services, plus you'll get 3 FREE Special Reports and primo access to all of the content on his website. FREE Special Report #1: Trading Silver in Your Sleep - A special report from The Morgan Report. For those not satisfied with having physical silver and gold lying around the house, owning mining shares, or even trading futures on the COMEX during the day, there is another way to profit from the metals bull market. FREE Special Report #2: Silver in The Next Decade. Know the facts, get the real information behind the curtain of confusion. This report is truly priceless if you make an informed decision on what forces are at work to drive silver prices much higher over the next several years. FREE Special Report #3: Harvesting Green on the Pink Sheets. You'll discover practical strategies for navigating the world of penny stocks and the surprising factors that separate the potential superstars from the inevitable losers. Click here to start your membership now and claim your 3 FREE Special Reports and Silver Eagle bonus. Or call 480-325-0230 to subscribe over the phone (mention this special offer through Money Metals). One thing I love about David is that he stands behind his investment services and monthly newsletter. He offers a 30-day money-back assurance on everything here. You must be completely satisfied with your membership in The Morgan Report. If not, let David know within the first 30 days, and he'll refund every penny you paid with no questions asked. And if you cancel, you may keep ALL the issues you've received as a Basic Plus Member and the Special Reports for your trouble. Click here to start your membership now and claim your 3 FREE Special Reports and Silver Eagle bonus. Ever since I started Money Metals in 2010, I've dedicated myself to educating investors like you about the importance of owning precious metals. David Morgan shares my passion for precious metals, sound money, and educated customers. Members in The Morgan Report have made great profits in resource stocks, ETFs, and options. But please don't delay. The sooner you prepare your portfolio, the more potential you have to grow your wealth as the precious metals resume their historic climb. P.S. Access David’s Morgan’s brilliant, solidly researched strategies to help you safeguard your savings and grow your wealth even as the coming currency crisis approaches. Try The Morgan Report now under David’s incredibly generous terms and receive an American Silver Eagle coin as Money Metals' gift! If you prefer, you may call 480-325-0230 to subscribe over the phone. Just be sure to mention this special offer through Money Metals so you are sure to get your free ounce of silver!